The fifth-ranked North Carolina Tar Heels will close out their ACC regular season on Saturday the same way they always do - with a game against the Duke Blue Devils, ranked No. 17. The two teams' longstanding feud is almost always mentioned first when people discuss great college basketball rivalries. But what's in a rivalry anyway? A good one is a bit like a good obscenity - you know it when you see it. It's an extra charge in the arena when the opponent comes to town; an unwillingness to give an opposing player the benefit of the doubt; a vilification of the other team's coach as an evil mastermind. But all that's tough to measure, and measuring things is sort of the point of what we do around here. So I gathered data on some of the factors we can quantify, to put at least a few numbers on what makes Duke-Carolina so intense - and to see if any other pairings have the stats to contend with Tobacco Road's finest for the sport's top rivalry. One obvious place to start is with the quality of the teams involved. I took every pair of teams that has played each other at least once every other season1 for at least a half-century, and sorted them by the average harmonic mean of the two teams' Elo power ratings whenever they played. (I used the harmonic mean to make sure both teams hold up their end of the bargain in terms of high ratings.) 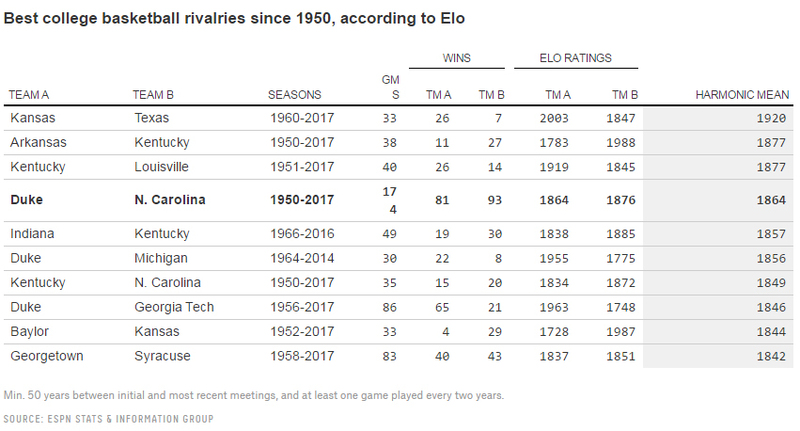 By that measure, North Carolina and Duke have the fourth-best rivalry since 1950, which is when our dataset starts tracking Elo. Of course, rivalries are about more than just how good the two teams are. In the case of Duke-Carolina, it's also about the sheer number of times they've played each other: 243 games in total (not including Saturday's tilt), including 174 since 1950 - second only to the 198 editions of the "Civil War" staged between Oregon and Oregon State. And those games have been close, with UNC coming out on top overall, with a 93-81 record against Duke over the span of those 174 contests. In terms of proximity to a perfect .500 split, that's in the top 18 percent of all 843 rivalries in our sample. 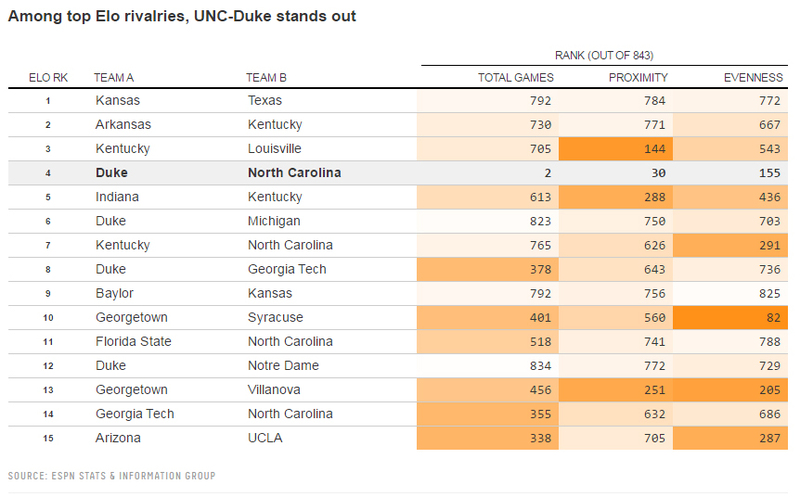 Proximity also plays a major role in Duke and UNC's hostilities. Aside from the 14 rivalries in our dataset that involve teams from the same city - think Saint Joseph's and Temple in Philly, or UCLA-USC in Los Angeles - North Carolina and Duke are the 16th-closest pair of schools, with only about 10 miles separating them. Add it all up, and it's difficult to find a rivalry that combines so many different measurable factors of animosity between two schools. None of the rivalries with an Elo rating in the same neighborhood as the Tar Heels and Blue Devils have played anywhere near as often3, nor do any have the physical proximity, nor are any as closely matched recordwise. It's a set of conditions custom-built for hate - and that's without even considering less-quantifiable factors, such as the cultural divide between a public university (UNC) and a private one (Duke), the fact that most UNC students are from in-state while most Duke students are from outside North Carolina, or the many memorable incidents that have stoked the rivalry over the years. Saturday's regular-season finale in Chapel Hill won't serve as the de facto ACC regular-season championship, like it has at times in the past. (UNC can do no worse than a tie with Notre Dame for No. 1 in the conference standings, while Duke can't win the conference.) But, as always, it will pit two of the nation's top teams against each other in a preview of the kind of high-caliber matchup each squad will face on the road to the Final Four. And maybe that's what stands out most about this rivalry: Both teams are always in the national championship hunt. (Famously, you have to go back to Feb. 25, 1955, to find a Duke-UNC matchup in which neither team was ranked nationally at tipoff.) 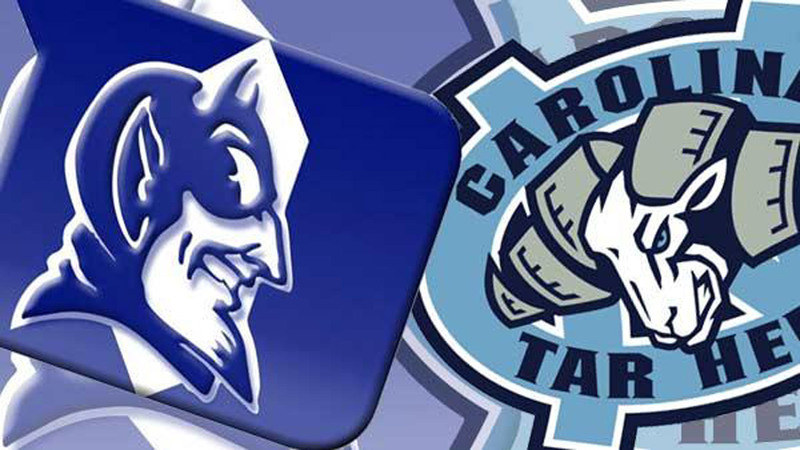 So no matter who wins, we'll be spending a lot of time with both the Tar Heels and Blue Devils over the next month.